Health Minister J P Nadda stressed the government is committed to increasing the size of pictorial warnings on tobacco products. “I want to take everyone along… Health issue is not to be compromised,” he said, replying to the debate on demands for grants on the ministry. “We respect your sentiments,” Nadda told opposition members who were demanding an explanation from him on keeping the notification on larger pictorial warnings in abeyance. The government has put on hold its decision to ask tobacco firms to introduce pictorial warnings covering 85 per cent of packaging for tobacco products from the present 40 per cent after the parliamentary committee on subordinate legislation urged it to wait till it submits its final report. The rule was to come into effect from April 1. Naidu rejected the opposition’s charge that there has been a major cut in the budget allocation for the ministry and said the government would soon come out with a national policy to make healthcare accessible and affordable to the people. “There are truths, half-truths and untruths… it is wrong, totally wrong” to say there has been a reduction, he said after several members expressed concern about less money being kept aside for the ministry in the budget. “There is no reduction… there is no cut in the budget. We have a prime minister who is very sensitive to health issues and a generous finance minister,” he said. The Obama administration is poised to finalize the Trans-Pacific Partnership (TPP) agreement. If Congress passes the current trade promotion authority bill, the TPP will become subject to a simple up or down vote, without possibility for any amendment. The Obama administration refuses to tell the public what’s in the agreement and Congress seems pressed to accept provisions that many Americans might deplore. This is a problem. Consider the TPP’s secretive advocacy for big tobacco. These agreements reduce tariffs on tobacco products around the world and grant big tobacco companies the right to sue governments that post aggressive warning labels on cigarettes. 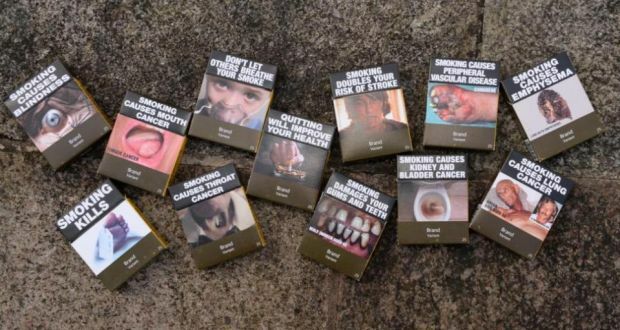 For example, Australia enacted a “plain packaging law” that depicts disquieting, smoking-related images on cigarette packages sold in its country above the brand of the cigarette. Tobacco companies sued. But it’s not just the big nations these companies go after — it’s also the poorest. Big tobacco companies claim developing countries like Uruguay, Uganda, Togo, Namibia, Gabon, and others are interfering with their brand names and violating intellectual property rights. To defend themselves against the little guys, tobacco companies have instigated or threatened litigation that could cost poor nations millions of dollars to fight. If the Obama administration caves to big tobacco, it would give the impression that Americans support not only these tactics, but also the general principle that smoking is safe and it doesn’t kill. They argue cigarettes should be treated like any other product. In the U.S. alone, tobacco annually costs over $ 170 billion in direct medical expenses and $ 150 billion in lost productivity. Globally, that figure rises to $ 300 billion per year. And the costs are not financial alone. According to the Centers for Disease Control (CDC), “more than 16 million Americans are living with a disease caused by smoking,” and what’s more “for every person who dies because of smoking, at least 30 people live with a serious smoking-related illness.” Yet, unless revised, the TTP will reduce tobacco tariff rates to zero and provide new rights to tobacco companies, pitting global public health in developing countries against the deep pockets of an industry that sells products known to cause serious health risks, including cancer and death. Some might suggest that this really isn’t our problem. After all, U.S. smoking has plummeted from 42 percent in 1961 to roughly 19 percent today. However, tobacco companies’ profits are at a record high. Why? Because big tobacco’s cigarette sales soar in developing countries after the U.S. government presses them to reduce tariffs. Statistics show the close link. On average, as developing country tariffs decrease by 1 percent, tobacco consumption rises by 2 percent, handsomely profiting U.S. tobacco companies. Further, tobacco companies bombard poor nations with advertisements that would be unacceptable in the U.S. In 2012, the U.S. Federal Trade Commission (FTC) reported that the tobacco industry’s “advertising and promotional expenditures increased [from 2011-2012], rising from $ 8.366 billion to $ 9.168 billion.” Tobacco companies strategically deployed their advertising, decreasing advertising in some capacities, to add to others. For example, the FTC also reported that tobacco companies spent $ 239.6 million on “coupons to reduce the retail costs of cigarettes,” increasing their expenditures by over $ 65 million from the year before. Tariffs, in contrast, provide the government with revenue that can be used to implement public policies, including health policies. The rate of smoking is high for men in Vietnam, at 47.4 percent, but low for women at just 1.4 percent. After tariff rates decline to zero, Philip Morris and other multinationals will aim to change women’s habits. They have already done so in other Asian countries with the U.S. government’s help. More importantly, there is no justifiable reason for including tobacco in the TPP, whatever one thinks of free trade or global economic integration. Mainstream economists contend that free trade makes more goods available at cheaper prices and thus increases a country’s welfare and its consumers’ standard of living. However, this core argument does not apply to tobacco. Predictably, consumer welfare will decline with increased tobacco consumption; we have seen this in the U.S. With tariff rates at zero, big tobacco companies will not only increase exports, but also bombard poor countries with advertising. Based on their record, how appealing do you think their ads will be? Of course, after Vietnam reduces its tariff rates to zero, it could increase its domestic sales tax to 135 percent. But anyone who has visited a developing country and seen their outdoor markets knows that collecting sales taxes is much more difficult And Philip Morris certainly knows that, which is why it wants the tariff rate at zero. Finally, this all raises important moral and ethical concerns about the Obama administration’s promotion of tobacco company interests through free trade agreements. Tobacco has a sorry history linked with international trade and investment agreements. It is a dark secret that tobacco companies make more use of these agreements than perhaps any other industry. There have been at least thirty trade and investment cases brought on behalf of big tobacco. The TPP will spur more. It is not too late to end U.S. government complicity. Congress can make clear that it will refuse to ratify a TPP that does not exempt tobacco products. It can exempt them under the current trade promotion bill. The lobbyists have benefitted from the secret negotiations that the Obama administration enforces on its trading partners through strong confidentiality agreements. It is time for the Obama administration to come clean on tobacco. The U.S. has a troubled history with Vietnam. The number of deaths it might now inflict through helping to promote cigarette use, an industry that accounts for one in ten adult deaths worldwide, especially among young Vietnamese women, will not make for a proud Obama legacy. Sergio Puig is Associate Professor and Co-Director of the International Trade and Business Law Program at James E. Rogers College of Law, University of Arizona. Gregory Shaffer is Chancellor’s Professor of Law and Director of the Center of Globalization, Law, and Society at University of California, Irvine. Why do smokers try to quit without medication or counselling? When tobacco smokers quit, between half and two-thirds quit unassisted: that is, they do not consult their general practitioner (GP), use pharmacotherapy (nicotine-replacement therapy, bupropion or varenicline), or phone a quitline. We sought to understand why smokers quit unassisted. Qualitative grounded theory study (in-depth interviews, theoretical sampling, concurrent data collection and data analysis). 21 Australian adult ex-smokers (aged 28–68 years; 9 males and 12 females) who quit unassisted within the past 6 months to 2 years. 12 participants had previous experience of using assistance to quit; 9 had never previously used assistance. Along with previously identified barriers to use of cessation assistance (cost, access, lack of awareness or knowledge of assistance, including misperceptions about effectiveness or safety), our study produced new explanations of why smokers quit unassisted: (1) they prioritise lay knowledge gained directly from personal experiences and indirectly from others over professional or theoretical knowledge; (2) their evaluation of the costs and benefits of quitting unassisted versus those of using assistance favours quitting unassisted; (3) they believe quitting is their personal responsibility; and (4) they perceive quitting unassisted to be the ‘right’ or ‘better’ choice in terms of how this relates to their own self-identity or self-image. Deep-rooted personal and societal values such as independence, strength, autonomy and self-control appear to be influencing smokers’ beliefs and decisions about quitting. The reasons for smokers’ rejection of the conventional medical model for smoking cessation are complex and go beyond modifiable or correctable problems relating to misperceptions or treatment barriers. These findings suggest that GPs could recognise and respect smokers’ reasons for rejecting assistance, validate and approve their choices, and modify brief interventions to support their preference for quitting unassisted, where preferred. Further research and translation may assist in developing such strategies for use in practice. The 12th Annual Asia Pacific Tax Forum, which will be held in Delhi from May 5-7, is being organised by Indian Council for Research on International Economic Relations (ICRIER) and International Tax and Investment Centre (ITIC). Among those participating in the event, according to the event website, are MoS (Finance) Jayant Sinha,revenue secretary Shakti Kant Das, Central Board of Direct Taxes chairperson Anita Kapur and Central Board of Excise and Customs chairman Kaushal Srivasatava. The list of sponsors on the ITIC website includes four tobacco companies – Philip Morris International, Imperial Tobacco Ltd, British American Tobacco and JTI Group that was formerly Japanese Tobacco. While Jayant Sinha was not available for comments, his office said that he will not attend the conference. “I have his schedule with me. I don’t think he is attending it. We never confirmed this,” said an aide. The website though prominently displays his name as one of the confirmed participants in the event. Health experts and activists are crying foul over the participation of government functionaries in an event partially sponsored by tobacco companies. In a letter to Finance Minister Arun Jaitley on April 8, Bangalore-based Institute of Public Health pointed out that the meeting is violative of the WHO Framework Convention on Tobacco Control. “ITIC’s sponsors include all of the leading transnational tobacco companies and its Board of Directors includes representatives from Philip Morris International, British American Tobacco, Imperial Tobacco and JTI Group. In addition, ITIC materials that are publicly available and internal tobacco industry documents made public through US-based litigation settlements show ITIC as part of the tobacco industry has worked for more than two decades to undermine tobacco control policies around the world…,” wrote IPH assistant director Upendra Bhojani in the letter whose copies were sent to Health Minister J P Nadda, Jayant Sinha and other officials named in the agenda for the event. The WHO Framework Convention on Tobacco Control (FCTC) states: “In setting and implementing their public health policies with respect to tobacco control, parties shall act to protect these policies from commercial and other vested interests of the tobacco industry in accordance with national law”. Referring to this section of the FCTC, the letter reminds the government that the FCTC secretariat has already sent out a note verbale to all parties, including India, highlighting the link between ITIC and the tobacco industry. “ITIC claims to secure its members including tobacco companies a seat at the policy-making table, thwarting tobacco control measures. Any Government of India engagement with them would be allowing conflicting interests to influence its primary duty to protect its own citizens from tobacco’s harm. It also contravenes India’s obligations under the international tobacco control treaty which requires rejection of such unholy alliances”, said Shoba John Programme Director, Health Bridge and Former Chair, Framework Convention Alliance. In an email response to queries from The Indian Express, ITIC refuted the charge that the tax forum is a violation of FCTC. “The International Tax and Investment Center (ITIC) is pleased to have the participation of a broad range of Indian government officials in the 12th Annual Asia-Pacific Tax Forum for a professional discussion of technical tax issues. It is impossible for this Forum to be even remotely considered a violation of the FCTC, since there are no tobacco-related issues on the agenda, which is purely focused on technical tax matters…” wrote Daniel Witt, president, ITIC, who is based in Washington DC. The list of cities and towns in Massachusetts increasing the minimum age to purchase tobacco products grew again this week, as on Monday night the Natick Board of Health voted to increase the minimum age to 21-years-old. The board also made several other tobacco related changes: banning the sale of blunt wraps and limiting the sale of flavored tobacco products to businesses that prohibit minors, though menthol, mint and wintergreen flavors were exempted from the ban. A report from MetroDailyNews.com did not provide a start date for the change, reporting that it will go into effect “in a few months” after a period of getting the changes publicized. Neither the city nor the board have posted the changes to its websites. Natick has a population of approximately 33,000 people and is located just over 20 miles west of Boston. E-cigarettes or electronic nicotine delivery systems (ENDS) have recently attracted considerable attention. Among some individuals there is strong debate and a polarisation of views about the public health benefits versus harms of ENDS. With little regulation, the ENDS market is evolving, and new products are introduced and marketed constantly. Rapid developments in manufacturing, marketing and consumer domains related to ENDS will warrant frequent re-evaluation, based on the state of the evolving science. The purpose of this article is to describe a protocol for an ongoing comprehensive review of the published scientific literature on ENDS. We will undertake a systematic review of published empirical research literature on ENDS using the National Library of Medicine’s PubMed electronic database to search for relevant articles. Data from included studies will be extracted into a standardised form, tables with study details and key outcomes for each article will be created, and studies will be synthesised qualitatively. This review synthesises published literature and presents no primary data. Therefore, no ethical approval is required for this study. Subsequent papers will provide greater detail on results, within select categories, that represent gaps in the literature base. SHANGHAI (Reuters) – China’s parliament has passed legislation that restricts tobacco advertising in public, strengthening efforts to curb smoking in a country where more than a billion people are smokers or exposed to second-hand smoke. A revised Advertisement Law approved on Friday by the Standing Committee of the National People’s Congress, China’s top legislative body, bans tobacco ads in the mass media, in public places, on public vehicles and outdoors, the official Xinhua news agency reported. Smoking is a major health crisis for China. More than 300 million people have made cigarettes part of the social fabric, and Xinhua said another 740 million people are exposed to second-hand smoke. Last year, a health official said China was considering raising cigarette prices and taxes. The State Council, China’s cabinet, has issued a draft regulation to ban indoor smoking, limit outdoor smoking and end tobacco advertising. The amended law also outlaws tobacco products, their packaging and trademarks in advertisements for other products or services, Xinhua reported. China’s powerful State Tobacco Monopoly Administration, run by the younger brother of Chinese Premier Li Keqiang until February, had lobbied intensely to water down proposed restrictions on advertising, sources told Reuters in September. The tobacco monopoly wields extraordinary power because it provides an estimated 7-10 percent of government revenue – as much as 816 billion yuan ($131.8 billion) in 2013. Other changes were also made to the Advertisement Law. One bans advertising for dairy products, drinks and foods that claim to be a substitute for breast milk, Xinhua reported. Another stipulates that advertisements for drugs, medical equipment and healthcare products cannot use endorsements testifying to the effects or safety of the products. The revised law increases punishments for false advertising, bars children under the age of 10 from endorsing any products and prohibits advertising in schools or on educational materials, Xinhua reported. The national flag, emblem and anthem, as well as the army’s flag, emblem and song, are made off limits to advertisers, it said. Tobacco giants are funding the types of e-cigarettes that are LEAST likely to make you quit, according to a new study. The study looked at 587 people using e-cigarettes and compared those who used “cigalikes” versus those who used “tank” models. Cigalikes resemble tobacco cigarettes and are either disposable or use replaceable cartridges. The tank models, on the other hand, look different and have chambers that are filled with e-liquid. In the study around 76% of participants used cigalikes while 24% used tank models. After a year nearly a THIRD of daily tank users (28%) had quit smoking compared with 11% of daily cigalike users. This is roughly the same as those who didn’t use e-cigarettes (13%). Non-daily cigalike users were even less likely to quit than those not using e-cigarettes – with just 5% quitting smoking. The researchers – from Kings College London – flagged this as a cause for concern, particularly since the tobacco industry owns many of the most prominent cigalike brands. Plus tobacco industry-owned cigalikes tend to be most prominently positioned in the shops that sell them. That’s at the same time as tobacco giants are using MASSIVE lobbying power to dilute EU regulation of the industry. “At this point we don’t know why people who use tank type e-cigarettes daily are more likely to have quit,” said the study’s author Dr Sara Hitchman. There were a number of problems with the research, which the authors highlight, including a very small sample of volunteers – particularly in the group using the tank model of e-cigarette. Furthermore, the small group was very different in terms of age and education so it’s hard to prove the causal link between the type of vaping device and quitting smoking. Finally the study is from 2013; e-cigs have evolved a lot since then. “If this really does, eventually, turn out to be a true effect, then it argues for the use of these products within a regulated cessation programme, rather than using them as a consumer good,” said Professor Martin McKee from the London School of Hygiene & Tropical Medicine. “Given other concerns about the toxicity of long term inhalation of nicotine and the flavourings contained in these products, it seems that the precautionary approach adopted by public health authorities in many countries remains justified,” he added. Tom Pruen from e-cig trade body ECITA says he doesn’t think tobacco companies are producing ineffective products deliberately. “I think it’s more a reflection that the simple,sealed, cigalike products are better suited to the wholesale distribution channels they use, and the poor understanding of the market they had when buying up e-cig companies,” he said. The State wants to have a legal challenge brought against its plan to introduce plain packaging on tobacco products referred to the Court of Justice of the European Union, the Commercial Court has heard. JTI Ireland Ltd has challenged the Government’s plan to bring in plain packaging claiming it cannot unilaterally introduce it on its products as a member of the EU. In proceedings before the Commercial Court JTI is seeking orders preventing the Minister for Health, Ireland and the Attorney General from commencing the provisions of the recently passed Public Health (Standardised Packaging of Tobacco) Act 2015. JTI Ireland Ltd claims the State’s action is contrary to EU harmonisation objectives and an obstacle to trade between member states. JTI also claims the standardised packaging law imposes stricter rules than those necessary to transpose a 2014 EU directive (2014/40/EU). The stated objective of the directive is to harmonise labelling and packaging. The matter came before Mr Justice Brian McGovern today, who following an application by Paul Sreenan SC for JTI, agreed to admit the case to the fast-track Commercial Court division. The application was on consent. Michael Cush SC for the State parties told the court it is his client’s intention to apply to the Commercial Court to have certain legal questions arising out of JTI’s action referred to the Luxembourg based Court of Justice of the EU. Counsel made reference to the High Court of England and Wales decision to refer questions concerning the validity of the 2014 EU directive in a case brought by the Philip Morris tobacco company and British American against the UK Health Secretary to the European Courts. Counsel said similar issues have been raised in that case to those being advanced in JTI’s proceedings, and it was hoped the Irish case could travel together with the British case. In its action JTI says the Minister and the State do not have the power or competence to derogate from the provisions of the directive. This is because harmonisation of labelling and packaging is a stated objective of the EU directive, a member state cannot adopt national measures which further restrict the free movement of goods on grounds of a high level of protection for human health. JTI also claims the new rules, due to be introduced in May, will distort and impair the dynamics of competition in the tobacco market. In its action JTI claims the law means all tobacco products must come in standard plain paper packaging. JTI supplies 3,100 retailers with brands including Benson and Hedges, Silk Cut, Camel, Hamlet cigars, roll-your-own like Amber Leaf and Old Holborn, and pipe tobacco. It is part of an international tobacco group with operations in 70 countries and employs 90 people directly in Ireland. It says it paid €666.8million in tax here in 2013. Mr Justice McGovern agreed to adjourn the matter for two weeks, to allow the State bring an application to have the case referred to the European Courts.